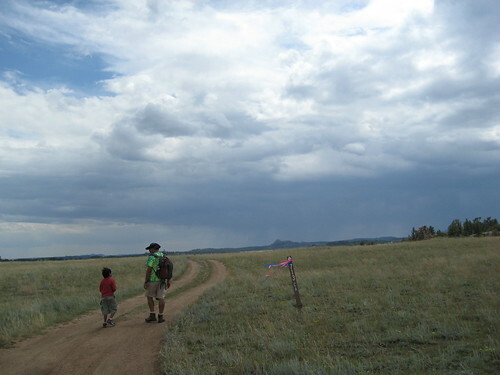 In which we brave rain, mists, Forest Service Roads, the high plains, lowing cattle, and camping in the cold, get taught the ways of the Wildlands Restoration Volunteers. We learn how to identify four different kinds of high-altitude wild grasses on the plains of Wyoming, pick just the ones they want, eat a lot of great food, listen to a real black-hat rancher who seemed to be a good guy, sleep again in the cold, do more gathering, and end up being dispersed by a thunderstorm to the various parts of the square states we belong to and get home again. On Wednesday afternoon, after I'd finished with a consulting job, we all left for Wyoming. On the way home from my little job, the rain sheeted down so hard and thick I had to slow down just to see. The roads in our development were flooding because the drainage system couldn't cope with the sheer amount of water. I went through foot-deep water in places and the boys had completely packed the van inside the garage, so that nothing had gotten particularly wet. One of the things we agreed on when we were on the East Coast trip was getting a GPS when we got back. John had done some research, and decided on one of the Garmin ones as the equivalent TomTom was having update problems. The newer maps were larger than the default memory so the TomToms were just seizing up when they were being updated. Not a great thing. So to just avoid it all, he went with the Garmin. Jet was fascinated by the whole concept. He loved watching the map move as we moved and loved matching up the map details to the details around us, especially the water ways that we were going over. We took a short trip to a friend's house to pick up a keg for the trip, and it didn't quite match up the house to the address. That worried him a little, but it was good to realize that there was room for error with the thing as John then decided on a way up north that the GPS just couldn't quite deal with. It really, really wanted us to take a more eastern route, going out to I-25 in order to head north. But John really wanted to drive 287 straight north. We finally turned off the voice and then turned off the whole navigation feature, as it not only got annoying but kind of confusing. That's when we found out that it was really good at showing us the map of all the streets around us as we went. That proved useful, it also showed the speed limits of all the roads we were on, and showed the names of the cross roads when there was no way we could see the street signs. It rained, on and off as we went, and as we headed higher and higher into Wyoming, the clouds got closer and closer until we headed up the mountain from Laramie (locally pronounced 'Laramer') and headed right into a dense fog. We couldn't see to go 40 mph, much less the posted 65 mph speed limit, and it was good having the moving map as we moved up into the mountains so that we could anticipate junctions. The instructions we had with us actually missed one set of turns that were more complicated than written, but having even the forest service roads marked out on the GPS really helped out. 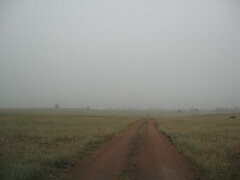 Eventually the fog opened up to a mist so that we could see some distance, but the dirt one-lane roads made for far slower going. We were very happy to have the Eurovan instead of the Passat, as the big van has a far higher ground clearance than the little sedan does, and old Land Rover driving lessons kept us in good stead as we rolled along the last "road" that wasn't even on the maps. It felt like Scotland in the spring, cold and misty, one-lane roads over rolling hills, except that there were long horn cattle everywhere, not the shaggy beasts or the sheep we saw all over the Highlands. Okay, and the simple fact that we were up in the 7000 foot range rather than the peaks of the Highlands being "only" 4400 feet high. Right. What the rest of the world calls creeks, we call rivers. What we call hills, you call mountains. It's all relative. We bumped and rolled and saw a neat little row of brightly colored PortaPotties. Beyond them was a white mess tent and scattered all about like brightly colored stones hidden amid the gray, green, and browns were the round mounds of tents. The folks that were already there had staked out places, and we were told that we needed to be within 100 yards of the road. So after some trail and error, John found a spot at the top of one of the mounds that was close to level, and we parked there. The mist and the clouds made for chilly weather. I ended up in a shirt, sweatshirt, and jacket with my rabbit fur hat on my head, as John had had enough foresight to pack those when there was no way I'd have thought to do so. It had just been in the 90's at home, and I couldn't conceive of it being cold within a two hour drive of home. Boy, was I in for a surprise. They served a dinner of grilled cheese sandwiches with snack items, chips and dips. There was hot water for tea and cocoa, pop, and beer, and everyone gathered around and ate and talked for a while. The kids found the s'more makings, and as it got darker they started a campfire on the open ground. The 'prairie' is actually interestingly sparse. 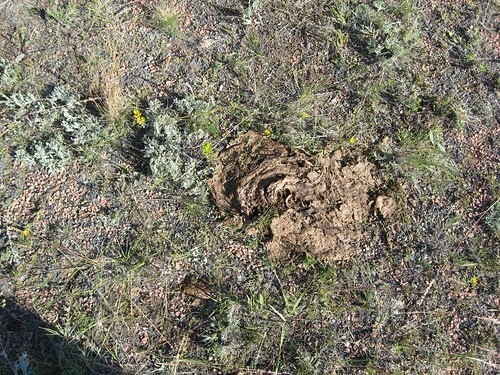 Yeah, that's a picture of a classic Cow Pie, they were everywhere around the site, but most of them dry enough to not be annoying. Thing is that if you look at the ground all around it, most of it is just dirt and rocks with bunches of grass or sage or plants growing through it in rather sparse arrangements. It's sparse enough that one can walk through without stepping on plants, and every once in a while there would be completely bare spots of just that red earth and gravel. The gravel turned out to be called 'rotting granite' and it crumbled everywhere, and once in a very great while there would be streaks of pure, shining white from a quartz vein that had broken up within the old granite of these old mountains that had worn smooth with time, water, and wind. After s'mores, it started raining. Slow at first, but then it picked up until some of us got our chairs and put them under the food and cook tents to keep them dry at night. Then the water started sheeting off the tents so that we had small waterfalls coming off the plastic. We waited a few minutes, talking with the kitchen crew while we waited, and then the rain started to slow down. So we all went for the van, brushed our teeth, and got ready for bed. In the dark, the portapotties were a lot further away than they'd been in the light. The boys dealt with that their own way. I got Jet's little wind-up flashlight, and headed down the road. On the way there, though, a car came at me with its headlights on, so I went to the side, but it stopped when it got even with me, and it turned out to be one of the families from church. They'd spent the last two hours on the forest service roads as someone had knocked one of the direction signs down (breaking it irreparably) and moved another one further down the road so that it was completely useless. I never understand people who do things like that. Anyway... they got help setting up their tent in the rain and dark, and I was thankful when the rain slowed even more; but the air was damp and cold and by the time I got back to the van, I was shivering. I put on sweat pants, dry wool socks, a t-shirt, sweatshirt, and still couldn't sleep until I finally capitulated and put my fur hat on as well. With my head covered I didn't lose heat as quickly as I could make it. It took a while for me to warm up enough to relax enough to sleep kind of fitfully. I must have gotten enough because I did okay the next day. John's alarm went off at 7. It beeped and beeped and Jet didn't even stir in the pop top of the van. *laughs* When John had dressed and woke him up, he hadn't heard it at all. The boys got out, I got myself together and went to breakfast. I'd known it was a no running water camping situation, so I hadn't even bothered with the contacts, and it made life just a lot easier. Breakfast was pretty amazing. Instant oatmeal, cut melons, boiled eggs, juice, coffee, and three different kinds of breads (banana, zucchini, carrot, and something else) along with bunches of bananas. The coffee was important. *laughs* And after breakfast they gathered us all up and split us into three groups. Two of which were doing Bunching Bluegrass and one of which was doing Needle and Thread. They're both different kinds of grasses. Our main job was to gather grass seed. But it has to be ripe, ready to plant grass seed. If it was dry enough and ripe enough, then we could just strip the seed from the stalks and keep those, and not bother the plant that much. If, however, it wasn't quite ripe, we could do like "tomatoes on the vine" and pull the stalk from the base (leaving the body of the plant) with the seeds hanging off it. The seeds would continue to ripen and when the forest service wishes to use them, they can then take the seeds of the stalks for their uses. I never knew there were so many types of grasses. Each of the two that we had to find had another type of plant that encroached on it and had different characteristics. The Needle and Thread proved to be the simplest to identify. It was tall, had a fairly loose structure to the seed heads, and when you pulled a seed out, it could be used as a dart that sinks, very readily, into all fleece. The long awn serves as a tail like a kite tail, so gives it some aerodynamic stability. *laughs* There were entire hills completely covered in the plants, and some patches were so thick, one would go wading through the tall grasses, and it was so thick there wasn't any way to avoid stepping on it, which was unusual for plants there. The thing is that the four-year-olds, being not nearly as tall as the grasses, would have anxious moments amidst it. All the kids did really well, and according to their attention span, all the kids did some seed gathering. The oldest lasted the longest, but then went and played with the younger ones on the rocks (out of the waist high grasses) and the best thing was that they all kind of looked out for each other and entertained each other. That was really wonderful to watch. Especially when Jet handed in a very 'clean' bag of seeds. He'd only picked the desired stuff, and in good quantity. The folks that were used to doing these projects on an on-going basis were really impressed by him. They were also unused to having kids along on these things; but they were all really good at teaching the kids stuff when they were interested. One young man, Ian, in particular was really good about explaining things to Jet when Jet asked questions. John G., the Botanist with the conservation group, was really fun, too, and had a four-year-old, so he was very eager and helpful when the kids had questions. To be fair, he was also really great with the adults with questions, too. Did you know that Pondarosa Pines smell like butterscotch or vanilla and have really spiky cones. We had snacks, stopped for lunch at about noon, all going the quarter mile back to the camp to eat in our camp chairs. We drank lots of water as the sun was playing hide and go seek for most of the day. It's kind of deceptive that way. Altitude plus wind plus sun equals dehydration quick if you're not watching for it. So all the kids got lots of reminders to drink, and the adults as well. In the afternoon, we switched to the bunching blue grass that's nothing like Kentucky Blue grass, and far too much like the "Cheat Grass" in terms of height and habitat. Cheat grass is called that because it germinates earlier than all the other grasses and usually steals the moisture from all the native grasses and then just takes over. It's an invasive species that shouldn't be there, and they use an herbicide at low levels (four liquid ounces per acre) that targets just the cheat grass' physical structure. They did the spraying two years ago, so the native plants have had a chance to come back, and with an annual cycle, the cheat grass was starting to come back. But it was a darker brown than the blue, and kind of curly, so it was possible to spot and avoid. We worked the whole afternoon, which cleared up and the sun was soon beating down on us and burning the more melanin-challenged of our group. When we went back to the camp for dinner it was clear and bright. They made beer brats, grilled melon and pineapple, grilled sweet peppers and onions to go on the brats, two kinds of potato salad, pasts salad, tabuli, mixed greens salad, and veggie burgers for those that wanted them. A rancher joined us and we could see his eyebrows go up at the 'veggie burgers'. *laughs* It was a lot of food, and then the ice cream came out and the kids went delirious. It wasn't even hand cranked, so they must have either just bought it, or had it packed in dry ice. I suspect the former, but everyone enjoyed it and then sat down to listen to Matt, who had a long list of awards for doing some real preservation efforts in the area. He came across as a "typical Black Hat" and even proudly wore a black felt hat, and started off with a long speel about how the Beef Industry is essential to the American Way of Life. It was interesting to listen to him, as he spoke as if he were ultra conservative, trying to rile up these Boulderites. *laughs* But a lot of his essential actions were much like ours, i.e. the land has to be taken care of, managed, or else there is no long term survival for not just his business but for everything he's involved with. Compared to the Wild West of 100 years ago, where this land had been grazed down to rock and desert, his generation's skills at reading the weather, knowing which ranges to use at what time of the year, and understanding the impact of his animals on the land, both positive and negative, is a new and much better thing. 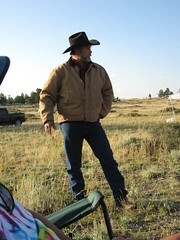 John G., whose job it is to go out and assess the publicly leased lands, said that Matt had a long history of really taking care of the lands he leased, getting his cattle moved on before any real damage was done, and actually contacting him for an assessment of how things were going. This was very much unlike other cattlemen who deliberately abused their lands to get as much as they could off them to the point of destroying them. The s'mores came out while it was still light, as parents wanted to get their kids to bed earlier rather than later, and it worked out all right. Ian fascinated Jet by using the coals to burn the bowl for a spoon and also used them to hollow out a block of wood for a bowl. He actually let Jet blow on the live coals in the bowl to help it burn down the wood without setting a flame. He very carefully explained to Jet what should happen, what shouldn't happen, and what he should do. So Jet had a wonderful time and stayed up late to do what he could with the bowl. The night was cold again, and after the heat of the day it felt colder, but when I actually went to bed, dry this time, it was clearly better. In the middle of the night I heard the soft sound of rain, and snuggled in warm and glad that we were dry now and everyone was in some kind of shelter. But by morning everything was dry because the wind had finally come back. Wyoming is known for its wind the way Boulder is known for its wind. There's stories of the guy on the street corner selling bricks on chains all labeled "Boulder Wind Chimes". They tell similar stories in Wyoming, and it was a nice, mild wind to start as we had pancakes, bacon, scrambled eggs, boiled eggs, the brats from the night before, fruit fresh and grilled, and plenty of coffee and juice. As the other volunteers said, "You don't lose weight on these things." We ate, we powwow'ed and it turned out that there were fields of a particular type of fescue and June grass just half a mile from the camp. Some folks chose to drive, I happily walked with Jet and John. Walking really stretched out the tendons and muscles that get bunched up and crazy when bending all the time to pick stuff, and a good long walk felt pretty good. We picked June grass. The seed heads are long but compact, no awns (hair thin fiber from the tip of the seed), and bunching with a stiff, red stem. They looked a lot like the fescue the others were picking, but the fescue was a little shorter, darker, and did have very short awns on the end of each seed. Jet got a huge number of seed heads from one bunch of plants, and he was crowing over it when someone looked closer and said, "I don't think that's what we're looking for." I looked it over, and said, "Why don't you go over to that other group and give these to them? They'll love you for it." And he did, and, sure enough, it was what they were looking for. Jet worked a little while longer after that, but then went and played with the other kids, watching the baby cows frolic as well as play with each other. What was funny was the two four-year-old boys that really took to each other and liked playing together. On that last day, they were sitting in the middle of the gravel road, covered in dirt, and throwing handfuls of small gravel into the air above their heads chanting, "Rock rain! Rock rain!" 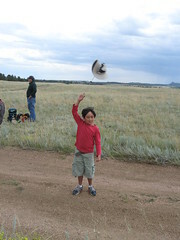 The wind kept picking up and Jet liked tempting it with his hat. 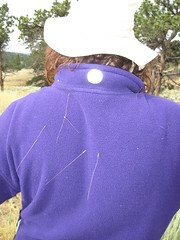 *laughs* The wind would beat down the grasses so fast and hard that, at first, it was really hard to identify the June grass any more, but then all of us suddenly noticed that the heavier heads with the stiffer stalks bent different than the other grasses. Then it got easier for a while. We walked all the way there and all the way back, and Jet accidentally dropped one of the pops and the rocks punctured it a couple of times. Luckily, it was a diet pop, so no actual sugars were leaking out, just pretend ones, so it didn't get actually sticky. So I held it for him, and we walked the rest of the way together. Lunches were out of a bag, they'd had us pack our stuff that morning, and in that wind it was more of a matter of just hanging onto every loose object so that it didn't blow away. And after lunch, everyone began to see why the wind had picked up. There seemed to be a storm brewing, and the low pressure there was sucking all the air from our place. The wind was right towards the really dark clouds. Around 2:30 they called it, said that the thunderstorm was coming too close to be safe when it arrived, so they got all the seeds into the trucks and sent us on our way. Poor Jet didn't get to say good-bye to everyone, and he'd especially wanted to say good-bye to Ian. But I think it's likely for us to do this again, sometime. It's such a good fit for the things we like to do, on the most part (NEXT time I'm bring the down sleeping bag), and the camping part of it we mostly have down. The learning part of it is really fascinating for all three of us, and it's going to be fun to do again if we can. ... but we got out okay, and on the way south went to a Panda Express and ate dinner. Once home, I decided that I"d do something I haven't done for a long time. I actually burnt incense and Hell Money the way Dog once taught me. And while the incense was still burning, I found that I'd gotten my new machine while we were gone. So, just in case, and because it doesn't hurt to do these things, I waved the incense smoke all over the box. When we set it up and powered it up there was this terrible clicking sound from one of the fans, and I was really unhappy with that; but John opened it up and found that there was a wire bundle that had moved so that it was shoved up against the fan. He moved the one bundle and the noise went away completely. The machine's proved to be much faster than the old one, with lots and lots of hard disk and a 64-bit Windows OS, so it's able to run things the old one couldn't and is much more capable than the old one was. It's funny but I also found out that I basically got wind burnt. Not sunburnt, but wind burnt on that last day. Aloe vera seems to work on that as well. Yay! That is some trip. Nice photos! I love taking the pictures. *laughs* There's more of them if you click on any of them, there's a whole set from the trip on flickr. That sounds an excellent trip. Glad you had such fun! Thanks!! It was really fun, tiring, but fun. What a cool thing to do. Bummer about the rain, but at least it wasn't the whole time. I've had wind burn before it was not fun. Hope it went away without too much fuss.